On the 21st of May 1848 the sailing ship, Rattlesnake, landed at Tam O'Shanter Point on the Southern side of Mission Beach. On the 24th May 1848 explorer Edmund Kennedy and his party started their disastrous trek to Cape York. All but three members of the 13 man party were killed and Edmund Kennedy himself was speared to death at the base of Cape York. The unveiling of a huge cairn at Mission Beach will take place on Sunday afternoon at four o'clock. The ceremony will be performed by Cr. Dickinson, according to present arrangements. The cairn, which is 12 feet in height, with a base of seven feet, the foundations extending for a further couple of feet, will carry a plaque commemorating the deeds of Kennedy. 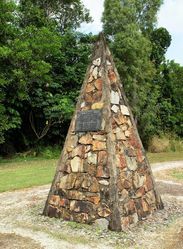 The cairn will be draped with the Australian flag and Union Jack, when Cr. Dickinson steps forward to perform the ceremony of unveiling. Townsville Daily Bulletin, 29th May 1948. To Commemorate The Centenary Of The Landing Of EDMUND B. C.KENNEDY AND PARTY Who Landed Two Miles South Of This Cairn From The Barque "Tam O' Shanter" On May 24th 1848 To Explore Cape York Peninsula.